As holidays are near and everyone wants to cheat a little with his or her dietary guidelines with consuming something that’s extra sweet, tasty and healthy too, chocolate can definitely add some happiness and the craving for something sweet can be accomplished. I think adding it will be a great idea, as chocolate makes everything good especially when mixed with almond and cashews….it tastes heaven! Sounds mouth watering? So let’s make it. Process the almonds and cashews in a food processor until it has a lumpy consistency. Melt the coconut oil in a saucepan for 1 minute. Mix the grounded nuts, coconut oil, stevia, shredded coconut and cocoa powder in a bowl. Line up a small baking sheet with the parchment paper. Pour the mixture over the baking sheet and set aside. Let it cool for a few minutes and then form it into a square shape. Freeze until hardened (approximately 20 minutes of freezing). You can substitute almonds and cashews with macadamia nuts and hazelnuts. You can substitute stevia with 2 tablespoons of Xylitol (warning: toxic for dogs) or with ¼ cup of raw honey. This protein rich almond and cashew bars easy recipe satisfies hunger and keeps us full for a longer time as it contains a good amount of protein and fiber. 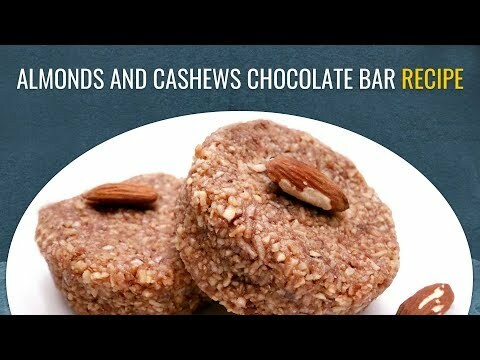 This gluten-free and the sugar-free recipe is all that you need when you are weight loss plan and crave for chocolates. This tempting delight is something that everyone will love. I just can’t wait to have it.